Photographing the diamond backed sturgeon at Jackdaw quarry. This sturgeon was photographed at Jackdaw quarry, Capernwray, in Lancashire - which is a flooded former quarry now a popular dive site. There are a few sturgeon to be found in various British locations. I returned a second time this season in order to photograph this large attractive diamond backed specimen. A perch or two are sometimes to be seen shadowing the sturgeon in the hope of getting something to eat, as the sturgeon sifts through the bottom looking for food. 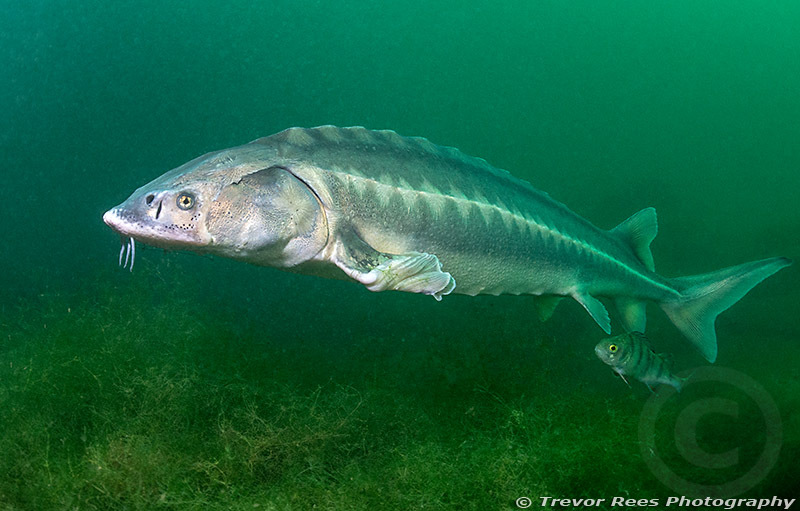 Often described as an ancient species, sturgeon have remain largely unchanged for millions of years. There are a few different species, with this one likely to have been released from from having outgrown its former home of a garden pond. Interesting to see that they are growing and surviving well.